Our e-mail subscribers get the inside scoop on new products, exclusive events, promotions, and more. Check out the Aug. issue of "Sophisticate's Hairstyle Guide" to see the hot trends for 2018, featuring salon manager, Robert's, exclusive interview and tips for styles to go for this year! Thanks again to "Sophisticate's" for recognizing Robert, showing that his hard work is truly paying off! Enjoy a complimentary Bloody Mary made by your favorite stylist while you wait, or while you get your shampoo! You can have one while we cut too, but it's recommended to the more intermediate to professional Mary-types. 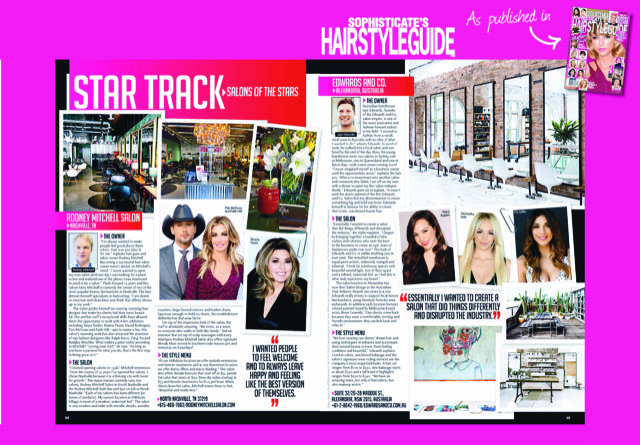 Big thanks to "Sophisticate's Hairstyle Guide" for the amazing article that was published this month, featuring Rodney and the salon! Thank you to everyone who supported us over the last 20 years! Cheers to another 20! !